For the past four years I’ve worked almost exclusively with a Mamiya 7 camera, and is what I used for Motherland. I’d originally planned to use a 5×4 field camera for the trip but because of logistical reasons I decided on the Mamiya. (Traveling for a year across Russia meant that I needed a light, versatile camera that could cope with very cold temperatures). We English will all be shot on a 5×4 camera. 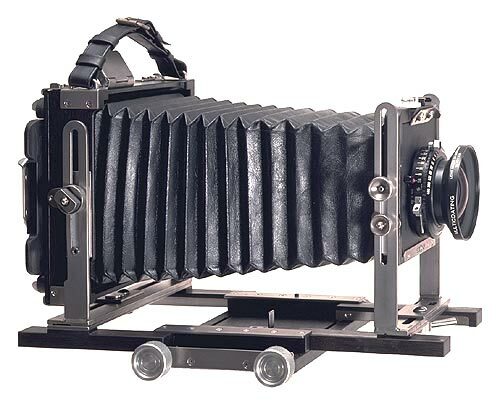 I’m going to be using the beautiful Ebony 45S (see photograph below), a lovingly crafted camera made from ebony wood and titanium. It is lightweight, compact and easy to use. However, what I’m most enamoured by is its simplicity and purity. It is the antithesis of our modern digital age and is a far more contemplative process to image making, too rarely seen in our twenty-four-hour news media world. Importantly for me, I also take better photographs with it! There is something much more personal about my relationship with the camera, partly due to the amount of time and effort it takes to compose an image, where I find myself being more considered in framing every scene. This relationship also extends to my subjects who I find relate to me as a photographer in a more intimate way and, on the whole, tend to take the image making process more seriously than if I was snapping away with a smaller, hand held camera. In a bizarre way, I also tend to get more spontaneous photographs, especially in situations where there a lots of people in the frame, mainly because by the time I’ve set-up and am ready to take the photograph, people have got bored looking at the camera and continue with what they were doing. I’m going to be photographing exclusively with a Schneider 150mm lens using Fuji Pro160 S film. This entry was posted on Tuesday, April 8th, 2008 at 2:21 pm	and is filed under TRIP LOGISTICS. You can follow any responses to this entry through the RSS 2.0 feed. Both comments and pings are currently closed. It’s nice to see someone doing what that love no matter what the rest of the world says. Blimey, that Schneider thingy looks knackered. Have you checked out the digitals down at Argos? Good luck with your trip, I have just come across your blog and love the idea and project you are undertaking, concerning your kit, I use 5×4 Wista all the time, once you get into the spin of working with it, it is easy, digital has a place but 5×4 is a great way to work, try pol55 for a instant neg and even readyload film can go in the pola back.